SoftPlanet makes it possible for everyone to get free Zulu DJ download directly from our servers. There is no registration needed for downloading. Zulu DJ 3.41 is a simple and free application that will give you a chance to become a DJ while being at home. Using this app you can create your own playlists, apply various effects, cut, edit an copy various sections of the song, distort beats, mix songs, slow them down and much, much more. Just leave it to your imagination and create new music wonders … that is – if you can! Zulu DJ is unique software because it gives you all the tools that you will need to be a successful DJ, even at home. Yet the program is completely free and small-sized. It really is up to you given you know what you want to create. The thing that will shock you the most is the sheer number of the functions this software comes with – you get tens of program buttons, an integrated music player, options, options, options and even more options... Knowing that Zulu DJ is free will make you think how these people achieve this and perhaps more importantly why. The interface of Zulu DJ is not attractive – it comes in gray colors that you don't seem to be able to change. Furthermore the app is full of small buttons and icons that are hard to use. Generally speaking this tool has the same DJ interface many other similar programs have – a large window divided in two smaller windows that have the same design and buttons. All of them allow you to apply various effects to the songs you work with. Frankly the interface is not impressive at all although it provides all the functionality that you will need. Maybe given that this is a free application we should not complain too much but again – if you are looking for nice colors, etc. this is not your application. 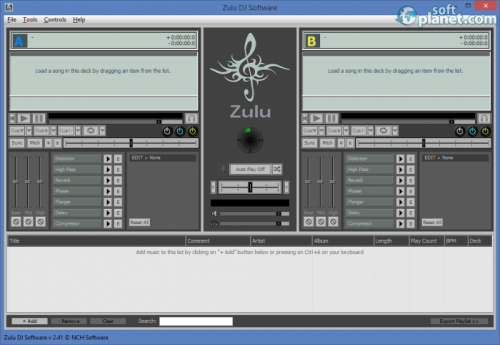 Zulu DJ 3.41 is a small software tool that will test your DJ skills. It may as well help you discover new skills in this field. The program is small, packs numerous functions and perhaps most importantly is free so there's nothing to lose by using it. Still, novice users will have a hard time getting used to it as it comes with so many functions it is easy to get lost. In addition the interface could have been easier to use... Still Zulu DJ is a nice program that will serve you well. Our security scan shows that Zulu DJ is clean from viruses. 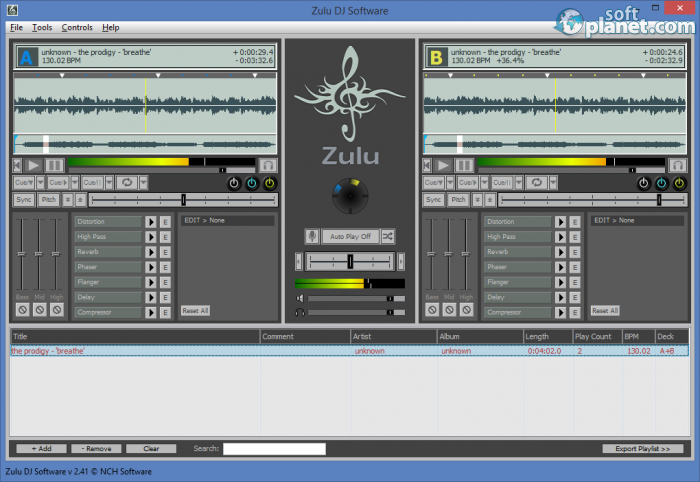 The current version of Zulu DJ has been scanned by our system, which contains 46 different anti-virus algorithms. That ensures that Zulu DJ 3.41 is 100% safe for your computer.